It started out a grey and rather yucky day in Baltimore. I decided we needed some pretty pictures. So—here are some pretty pictures. They’re from the Carrow Psalter. It’s a psalter written in East Anglia, the Norfolk/Suffolk/Cambridgeshire area part of England that used to be the heartland of the old Danelaw. Written in the mid-thirteenth century, it appears at Carrow Abbey (near Norwich—still within East Anglia) at some point in its fairly early history. And, yes, this is abbey where Julian of Norwich was said to have received her training. (Indeed, if a certain expert on Julian wants to weigh in further, that would be much appreciated!) Could she have seen or even used this psalter? Who knows. I’d like to think so! In addition to the Julian connection, I like this book because of one of the saints who figures prominently in it is St. Olaf. Here we’re likely seeing some of the old cultural connections from the Anglo-Scandinavian character of the Anglian area. It’s significant to me as I’m an alum of St. Olaf College. Here’s the url linking to the full manuscript from the Digital Walters: W.34, Carrow Psalter. 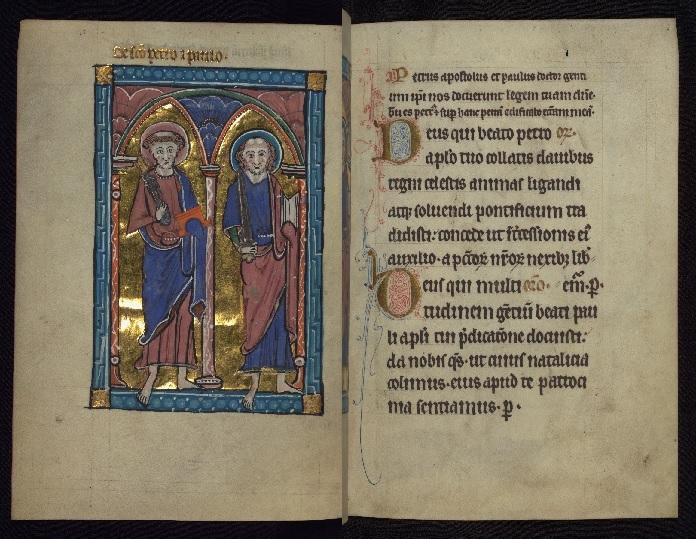 The psalter opens with this full page spread of Peter and Paul with facing collects. Following traditional iconography, Peter has the keys, Paul has a sword and is bald on top. The collects are relatively straightforward. The Early Church knew of the dust-up between the two described in Galatians 2, but the tradition describes them patching up their difficulties and the story is told of their joint martyrdom in Rome. Liturgically, the two are connected because whenever a feast of one was celebrated, the collect of the other was included as a commemoration immediately thereafter. That’s basically what we have here—the collect from the Chair of St Peter followed immediately by the commemoration of Paul. Here’s the next full page spread. If you can see up at the top above the figures, they are labelled St. Barnabas and John the Evangelist. However, if you look very carefully at the second collect, you may notice something odd. It mentions “gemini” (twins) and names both John and Paul (beatorum iohannis et pauli). Yeah—it’s the wrong John and Paul… Somehow the scribe has inserted the collect for the 4th century martyr brothers John and Paul who have an ancient titular church in Rome built over their tomb (which was also one of the “stations” where papal masses were held), and who are celebrated on June 26th. Not John the Evangelist. So—there are some pretty pictures from interesting manuscript that raise a variety of questions! Hopefully we’ll dip back more into this psalter in the future. 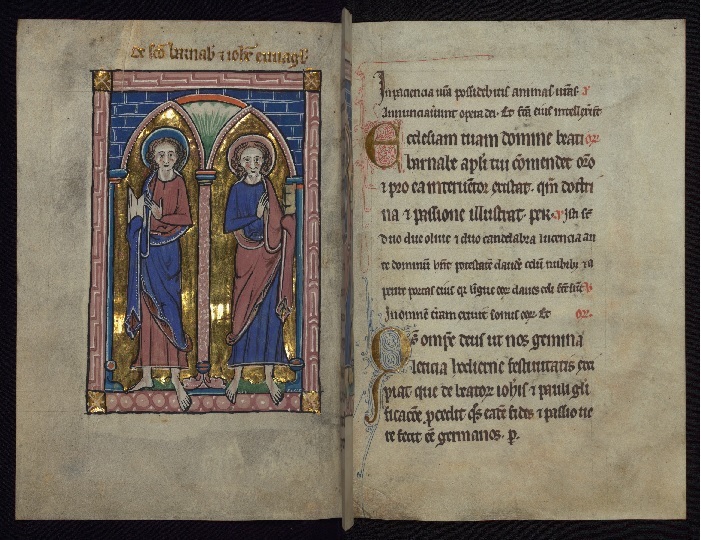 This entry was posted in Liturgy, Medieval Stuff, Saints on September 28, 2015 by Derek A. Olsen. Well, of course I’d comment, wouldn’t I?. 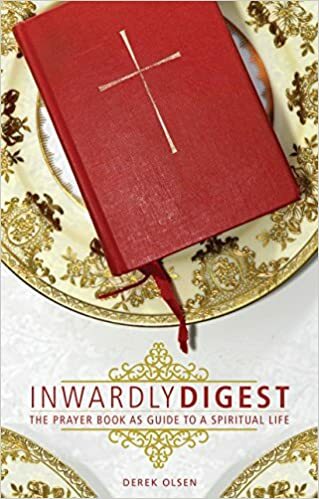 However, if she COULD read, she may indeed have at least SEEN that Psalter since Carrow (habitually called an Abbey, but it was, in fact, a Priory) held the advowson and virtually “owned” St. Julian’s Church—and we know that a Carrow nun lived in Julian’s cell after Julian died. In fact, Carrow would have had to give permission for Julian’s building her anchorhold at St. Julian’s, so her connections with Carrow were very close, indeed. But yours is a absolutely wonderful discovery—although I stewed in Julian and Norwich for thirty years, I never even heard of the Carrow Psalter. What a glorious and splendid find on your part! Kudos to you!